Involvement with the green building movement in the 1990’s sent me on a path to discover a meaning of “sustainability.” The most commonly quoted definition referenced achieving “aspirations” today and in the future. That’s a broad concept, not very measurable. I remember liking the idea of creating environments in which all life could “thrive.” But I didn’t have a clear definition for that either. Today “resilience” is a favored concept within the movement. That fits buildings well, and could be applied to people bouncing back from challenges. But it seems too defensive, not addressing the possibilities of life. I’ve recently read a book by psychologist Martin Seligman, a leading proponent of Positive Psychology. It’s called “Flourish: A Visionary New Understanding of Happiness and Well-being.” That life should “flourish” hits the mark for me. I’m interested in contributing to that. 5. Positive Relationships — the best antidote for downs of life … single most reliable up. That last one, recalls the observation by General Colin Powell (see my previous post to From the Editor) that “…it’s all about people … how we touch and are touched by the people we meet” … creating and flourishing with positive relationships. So, Why do this? The answer for me is to do it with a purpose … to contribute to the well-being of others. 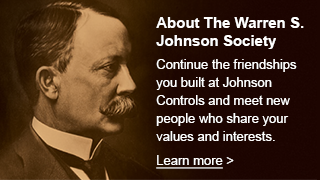 The WSJ Society and WSJSociety.com are certainly not complete solutions … but maybe if we try hard enough, we can help someone … other members … other alums or current employees of Johnson Controls … or maybe someone who just happens to find WSJSociety.com. The website needs a clean-up. How about doing it with a focus on “promoting well-being” for our visitors? This will take time and expertise beyond mine. Would you consider joining the clean-up team? Think about it … let me know if you might consider making at least part of your contribution through the WSJ Society and WSJSociety.com.